Do you see the cardinal in flight? When the one landed on the walk, the other took flight. He flew off so quickly, I didn’t think I’d caught him in the shot at all. In another shot, I didn’t realize I’d captured 2 females. I was concentrating on the two males, and saw the 2 females. So it was fun seeing the 5 cardinals at the feeding station nearly, only not all at the same time. To capture these, I have to move a stool in front of the window and have my camera ready to get above the screen and hedge. When I do this, they often see me and fly off. So I was really fortunate that I was able to capture any of them at all! Comment at Royal Reviews for chance to win! 🙂 http://theroyalreviews.blogspot.com/2014/09/shifters-galore-let-fun-begin-by-terry.html This ends on Oct 1! Do you have cardinals around? I didn’t realize I had so many until two males landed on the feeder at once and I knew another was much brighter red than them. I learned that the two in this picture that aren’t as bright red are the young males and they’ll keep changing until their feathers are all red. 🙂 And this was the first time I saw the two females at the same time. 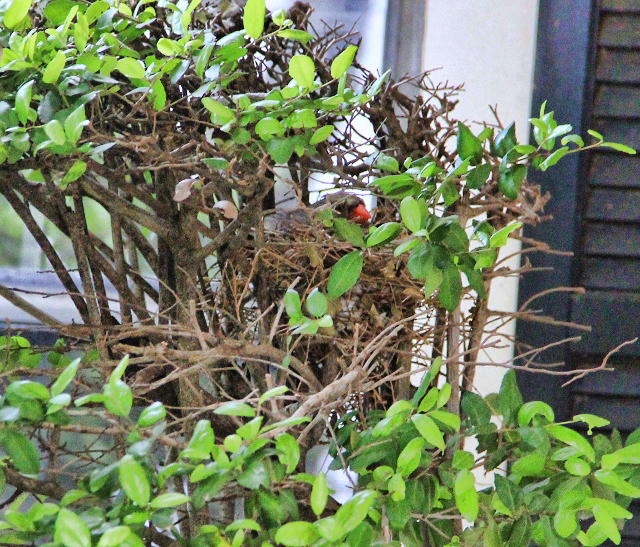 I thought maybe the one and the bright red male were Mom and Dad, because one pair of cardinals had two babies. I’m back to working on Cougar, bears, and wishing you a Happy TGIF!!! ← Butterflies! & Faery Realms Party!